"With emotion gripping his voice, Graham at times paused to collect himself and recount a chapter of his life that still weighs heavily upon them. He said they were broken by the devastation of losing both of their sons. Though Army leadership gave him time to work through his grief, Graham wasn't sure if he could continue with his career. He said the Army family and the Lawton-Fort Sill community reached out and gave them the support they needed to get through a wrenching time." Maj. Gen. Mark Graham, Forces Command deputy chief of staff for operations and training, speaks June 13 at Fort Sill, Okla., during the Graham Resiliency Training Center dedication ceremony that honors his two sons, Kevin and Jeff, both considered casualties of the ongoing war. 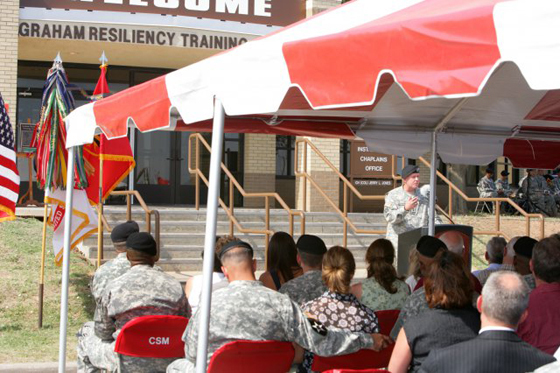 FORT SILL, Okla. -- Being a place where people can go to get help with issues confronting them, Fort Sill's resiliency training campus was dedicated Monday to a family that has portrayed exactly what resiliency is all about. The Graham Resiliency Training Center is named in honor of the two sons Carol and Maj. Gen. Mark Graham lost: one to combat in Iraq, the other to depression and suicide. Graham, Forces Command deputy chief of staff for operations, plans and training, often overcome with emotion, thanked those in attendance and everyone in the Lawton-Fort Sill community, people he called family in a place he and his wife call home. The Grahams' children were born here and went to school here, so their roots in the area go deep. He called it a wonderful community that comes together to help people everyday and said the campus will continue that effort. "Fort Sill is leading the way, I think, in our Army, in ways that are helping our Soldiers and families know that it's a sign of strength to come forward and seek help," he said. Speaking for his family, the general said they are extremely touched and grateful for this honor. Maj. Gen. David Halverson, Fires Center of Excellence and Fort Sill commanding general, said the Grahams are advocates for wounded Soldiers raising awareness to the hazards of untreated depression, post traumatic stress disorder, traumatic brain injury and other invisible wounds of war. Despite the tragedy that struck them, they established endowment funds at the University of Kentucky, where their son, Kevin, attended school, and Cameron University to provide education awareness of depression and suicide prevention. Carol is also a national board member of the Suicide Prevention Action Network which informs people about suicide. Halverson mentioned Graham's son, Kevin, and his dream of becoming an Army doctor. He also spoke of the young man's battle with depression. He added Kevin was embarrassed about taking medication and was concerned how the stigma attached to such medications might affect his intended career choice. Opting to quit taking the medicine, Kevin not long after committed suicide in June, 2003. "Kevin became a casualty of war, not in the traditional sense, but a casualty of emotional illness and something he could not treat," said Halverson. "This is why the resiliency center is here, to treat these conditions and to open doors to people to get the treatment they need." He called resiliency a multi-faceted weapon to combat a more elusive enemy. By committing to this, through time and effort, people can take steps toward emotional fitness. Later, that same year, Graham's other son, Jeff, died in combat in Iraq. With emotion gripping his voice, Graham at times paused to collect himself and recount a chapter of his life that still weighs heavily upon them. He said they were broken by the devastation of losing both of their sons. Though Army leadership gave him time to work through his grief, Graham wasn't sure if he could continue with his career. He said the Army family and the Lawton-Fort Sill community reached out and gave them the support they needed to get through a wrenching time. "Lawton has a special place in our heart, because we did come back and you all have been amazing to us," he said. Graham said he often speaks about doors being open and being the right ones. He said every door at Lawton-Fort Sill offers what people need to carry on. "You don't allow a door to stop a Soldier or a family member from getting help; you let every door be the right door," he added.